August 14, 2013 - At 6:11 AM a United Parcel Service (UPS) Airbus A300-600, Flight 1354, N155UP, out of Louisville, Kentucky crashed on approach to Runway 18 at Birmingham Shuttlesworth International Airport, Alabama, both the pilot and copilot were killed on impact. Birmingham Mayor William Bell reported there were no other casualties reported. The A300 crashed just less than half mile from the airport in an open field, debris was strewed across a large area, and no homes were affected by the crash. The aircraft was carrying heavy cargo, freight and small packages. The airport tower had no indication that the pilot had any type of problem onboard. The pilots did not make any distress calls. Weather conditions at the time of the crash were favorable. The winds were from the NNW at 5 MPH with a few clouds at 1,100 feet, at 3,500 feet the clouds were broken and at 7,500 overcast with rain showers off and on. Upon impact, the A300 fuselage broke into two sections. The rear of the aircraft was fully engulfed in fire while the front remained somewhat intact. Birmingham Fire and Rescue Chief, C. W. Mardis said it took firefighters about an hour and a half to extinguish the fire. Mardis further reported there were two explosions from the aircraft after it had crashed. Flight 1354 departed Louisville International Airport, KY (SDF) at or about 5:04 AM. The twin engine Airbus A300-600 widebody aircraft, official designated A300F4-600 which is the freighter version of the baseline 600, was delivered to UPS from Airbus’ factory in 2003. This aircraft had accumulated about 11,000 flight hours and conducted about 6,800 flights. The first A300-600F which is powered by Pratt & Whitney engines entered service in 1994. At the end of June 2013, 104 A300-600Fs were in service. Shanda Fanning, 37, of Lynchburg, Tennessee has been identified as one of the pilots. Fanning held an Airline Transport Pilot Certificate with type ratings in the A/A-310, A/B-747-4, A/B-757, A/B-767, A/BE-400, A/HS-125 and A/MU-300. UPS has identified the pilots as Capt. Cerea Beal, Jr., 58, of Matthews, N.C. and First Officer Shanda Fanning, 37, of Lynchburg, Tenn. 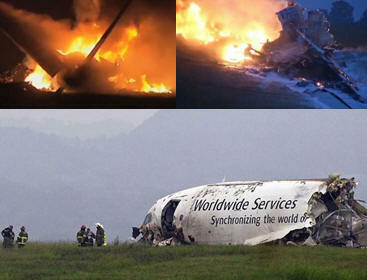 The National Transportation Safety Board has launched a full Go-Team to investigate the crash of UPS Flight 1354. Senior Aviation Investigator Dan Bower will serve as investigator in charge. NTSB Board Member Robert Sumwalt is accompanying the team and will serve as the principal spokesman during the on scene phase of the investigation. UPS Airlines President Mitch Nichols said, "This incident is very unfortunate, and our thoughts and prayers are with those involved. We place the utmost value on the safety of our employees, our customers, and the public. We will immediately engage with the National Transportation Safety Board's investigation, and we will work exhaustively on response efforts. Airbus said it will provide technical assistance to accident investigators". Back in September 2010, a UPS Boeing 747-400F, Flight 6, N571UP, crashed near the Dubai Silicon Oasis at or about 7:45 PM local time. The pilot had declared an emergency 50 minutes just after takeoff. Both the pilot and copilot were killed. This was the first such casualties in UPS' history. In November 2010, Agence France-Presse released the Arabic Al-Qaeda statement that the crash was due to onboard explosion of an air package collected in Yemen. However, this has not been verified. Authorities have sited the cause of the crash due to load of 80,000 to 90,000 lithium batteries.